After defeating Ultra Necrozma and returning to The Alola Region, the Ultra Recon Squad will continue to allow you to explore Ultra Space with the help of their Legendary Pokemon. While traveling through Ultra Space, you may sometimes enter a White Wormhole that leads to Ultra Deep Sea. This location may seem familiar to you at first, as it's the bit of Ultra Space you first explored back in Pokemon Sun & Moon. As in those games, this is the dwelling place of Nihilego. 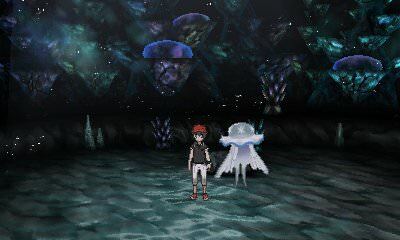 In order to battle Nihilego while in the Ultra Deep Sea, simply sit in the chair at the very end of the passageway. (If you visit the Ultra Deep Sea on more occasions after your first, Nihilego will just be standing at the end of the corridor.) Nihilego remains a Rock / Poison Type Pokemon, always being found at Level 60 and knowing the moves of Power Gem, Acid Spray, Stealth Rock, and Mirror Coat. Like all other Ultra Beasts, it can now be found in its Shiny Form. It will also respawn with each successive visit to this area.